In its 11th year, this festival provides the perfect showcase for SA music talent. 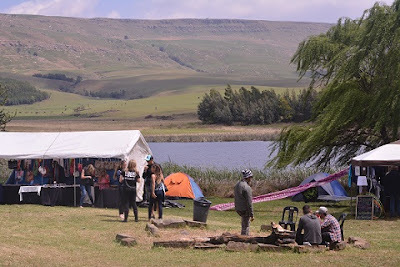 In the foothills of the berg near the majestic Thabanhlope/ White Mountain, the setting is perfect and the artists travelled from all over South Africa to be part of this event, as did the audience. The audience is a true mix of ages, attitudes, cultures and backgrounds but they have one thing in common – their appreciation for good music. The organisers must be congratulated on providing a large marquee with sufficient camping sites nearby, including the newest addition, a tent hotel, as well as numerous crafters and food and drink outlets. A huge part of the success of this festival is the near-perfect acoustics. Huge congrats to the sterling work done by the team of technicians from Kingston Sound who worked tirelessly to maintain the balance and excellent sound quality for each performance. They also provided the excellent lighting. This is acoustic music at its best – soloists and groups – with a bit of variation thrown in! From the local Zulu dance group performing with great energy outside near the dam to the Celtic jigs from Jenny and the Jameses, there was truly something for everyone. The seven Open Mic slots, three being indoors in Tom’s Tavern, allowed for some newcomers to get the opportunity to perform for this discerning audience who were welcoming, encouraging and yet critical. It is difficult to single out any one artist or one group as the favourites as there was just so much talent and so many really great performances. 12 solo performances and 14 groups made up the three-day programme. Only a few will be mentioned. The opening female vocalist set the tone so well. It is never easy to be the first on stage and Cheryl Engel immediately had the audience on her side. With her sunny Durban smile and well-controlled voice, she was both charming and easy to listen to. Shomon was welcomed back after a break last year and her mellow tone and meaningful lyrics resonated well with the receptive audience. Definitely one of my favourites. Friday’s line-up included a number of excellent male solo performers: Matt Gardner from Pietermaritzburg is definitely well on the road to stardom with his interesting original songs and his strong, open personality while Gavin Ferguson from Durban had a wide range of styles and some outstanding guitar playing. But it was the five-piece group, Georgetown , who really got the music moving. With a variety of instruments including a ukulele, saxophone and even a washboard together with their outstanding harmonising, this hillbilly group certainly knew how to rouse the crowd! They are definitely both unique and creative - superb! Saturday’s line up was equally varied and enjoyable. Mbijana SIbisi with his strong, well-controlled voice and interesting original songs was most impressive. His vocal range and excellent rapport with the audience made him one of the favourite soloists. We will be hearing a lot more from him, I am sure. Jeremy Oliver is an experienced composer and arranger as was obvious from the meaning in his songs and from his interaction with the audience. It is clear that music is his life and soul – he was totally involved in every note he played – most impressive. A newcomer to White Mountain and to the music scene, Richard Stirton will definitely go from strength to strength. A well-deserved winner of The Voice he certainly does have a powerful and well-controlled voice! His rendition of Sounds of Silence showcased his talent and the audience just loved him. Jenny and the Jameses showed that the Irish have something special when it comes to music and fun! Playing mainly traditional folk music, they soon had the audience dancing and enjoying every moment. Ending the evening was the well-known popular group, Bad Peter. Their energy and lively tone was the perfect way to close this festival. Playing well beyond their allotted time, I think the audience would happily have carried on for another hour! A special mention must be made of one of the dancers in the line-up who became a focal point. With an unusually creative interpretation of the music, she performed her moves with a perfect rhythm and with such obvious enjoyment that many people were focused on her effortless and fluid movements. Thank you for sharing your talent, Anthea, from One Circle International! And if you think White Mountain is only about music, you are wrong! We were blessed with warm sunny days in spite of the forecast of 100% rain, so the outdoor activities were thoroughly enjoyed. There was canoeing and fly fishing, strolls for the not-so-fit and hikes for the adventurous as well as yoga and softball. The children had organised games, face painting, treasure hunts, stories and movies. And there were even a few brave souls who swam!